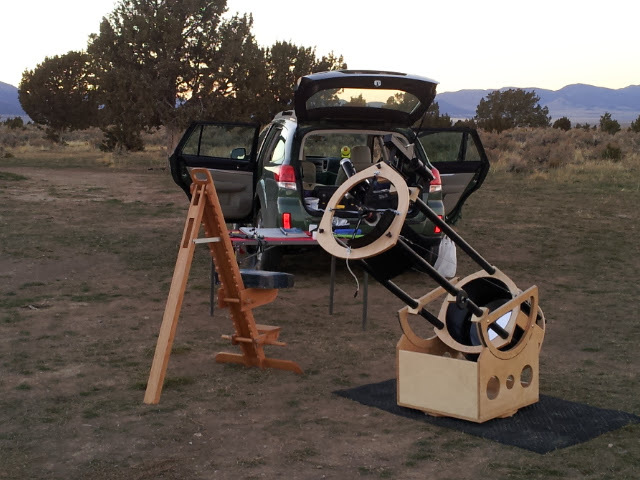 My blog is about my venture into the world of amateur astronomy and visual observing and sketching. I haven't posted in many months, in truth, I only have been out a few times since April of 2018 with my scopes. I have had changes in my life this year and have had a health concern that has made me not be able to spend time on the hobby. I anticipate sometime in the spring or summer of 2019 to be back enjoying the hobby, perhaps once a month or so and being able to go alone. So until then, enjoy past entries if you wish, or move to other blogs as there are some great ones there. I need to focus on me, my family and my job over the next six months. Keep looking up and enjoying the marvels of our universe! With the selling of some of my larger equipment, I've decided I have far too many eyepieces so I am going to sell some off. Here is what I have. If your interested, comment with email and I'll reply via an email. I don't use PayPal so if your outside of the Salt Lake City area you'll need to make arrangements to pay by USPS Money Order or Cashier's Check. I ship when I receive the money. Would prefer to sell local. You pay price and shipping. I am selling my Delos eyepieces (keeping my beloved Pentax XW's). I have the 17.3mm, 12mm, 10mm and 8mm for sale in their original boxes and plastic (no plastic on the 17.3) and each is $250.00 plus shipping. Above is the 8mm that has been used I believe only once. Great shape. Great buy. Above is the 17.3mm Delos for sale for $250.00. Again, I have used it a few times, less than 10 and it is in great shape. This one I am having a hard time letting go. It is the 12mm Delos and I have used it around 15 times or so. Love the views in this and the magnification. $250.00 plus shipping. Above is my 24mm Explore Scientific 82 degrees eyepiece. I have owned it for several years and only used it about 6 times, mainly loaning it to a friend. His focuser did put a couple of minor scratches on the barrel. Cost is $200.00 plus shipping. I prefer my 22mm T4 Nagler. Last eyepiece. Explore Scientific 30mm N2 purse eyepiece with 82 degree FOV. I have owned this for several years now and love the eyepiece but find I use either my 26mm Nagler, my 31mm Nagler or my 35mm Panoptic now. I have used it for viewing the Veil and it is outstanding. Filters fit hard on it and some paint has come off the inside of the area where the filter screws in. Price is $200 plus shipping. "I ended up with notes on 1,008 new objects and re-observed 801 others that had been covered in Volumes 1 and 2 of the Night Sky Observer’s Guide and added many new eyepiece impressions and photos." So this 500 page volume adds over 1088 new objects including all of Barnard's Dark Nebula in one volume.. I find the book very similar in format and layout to the other 3 volumes of the series, and have enjoyed reading his observations, viewing his sketches and photographs and will use it in planning some of my summer observing trips. One issue in my first edition is that the Table of Contents is off. The page numbers versus. the actual chapters don't match. They're fine until Cepheus, then the pages get slightly from there with Lupus being 4 pages off. After Lepus the pages improve slightly towards the end of the book asVulpecula is only 2 pages off. I( wrote to Willmann-Bell asking for permission to include the corrected Table of Contents insert I received as an insert in my copy, and haven't heard back. However, under Fair Use I am going to upload and share them here as PDF's in case someone wants to download them. These links are to my Google Drive and you they are public on the web so you should be able to download them. Hopefully that helps those needing the PDF for those two pages. Mine are front and back so you'll have to download the PDF's and then make a 2 sided copy. I do highly recommend the book though. Well as I have posted, on December 31st, 2017, Recurrent Nova M31N 2008-12a erupted again for the 10th recorded time, though this recurrent Nova in the Andromeda Galaxy, M31, has probably been doing this for million of years. 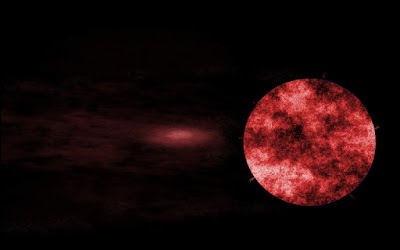 It is close, getting closer to either collapsing into a neutron star when it reaches the Chandrasekhar limit of 1.4 (1.44) solar masses if it is a Neon/Oxygen White dwarf, or into a Type Ia Supernova if the progenitor white dwarf is a Carbon/Oxygen White Dwarf. So far not spectra of Neon has been detected but we probably won't know until 20,000 years or so in the future when the event actually occurs. Okay, we won't know but our descendants will know. The drawing above shows an exagerrated RN M31N 2008-12a as a bright reddish star on the left middle of the sketch. 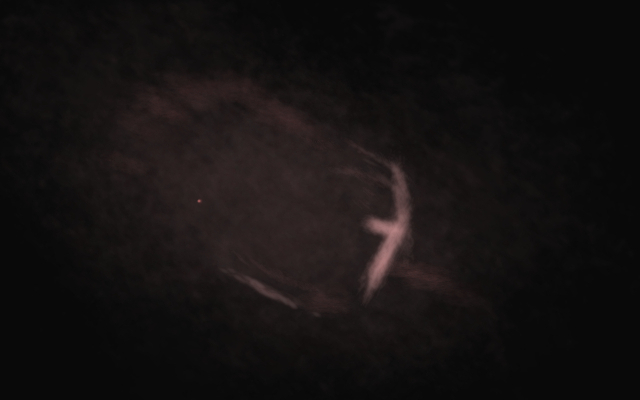 The rest of the sketch is my impression of the the extreme massive nova remnant that is brighter on the western side and arch and has filaments and other portions attached to it. This is based off of the XRay Data observation from the NASA Spitizer Space Telescope. Remember this is about as long as the Pleiades are from the Earth, thus a massive nova cloud. Here you see again the large red dwarf companion and I have not included material moving on a accretion disc from the red dwarf companion, and instead have included a wind that is moving material off the red dwarf and that is accretting material onto the white dwarf star which you can see. 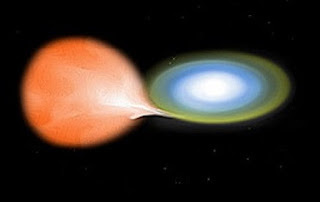 This is causing a build up of material on the white dwarf that ends in either the confirmed annual eruption of late December each year, or a bi-annual eruption with the second eruption occurring in the spring when material has built up, resulting in an eruption that is blocked from being seen because of the position of Messier 31 and our Sun, which acts to block this event each year. If you look at the material being blown off by the wind, using direct and averted vision I have tried to capture various layers of material being blown off and I think I have captured that nicely. I am fascinated by this object, and similar objects now in the Milky Way. I am working on a piece to share some of the closer and similar objects that are in our own Milky Way Galaxy. Truly our understanding of these complex systems is just beginning to emerge and the ground work being laid down here will impact future astronomers for a very long time! Observing and Sketches from December 19th through December 21st, 2017. 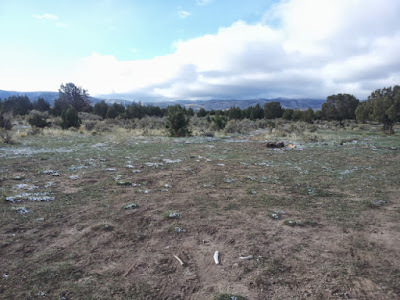 I got some observing in on December 18th and 19th, 2017 out at my dark site off of Forest Road 006 at Juniper Grove. A couple of images. A little snow on the ground but the ground was dry and not wet on this trip out. Some clouds at firt over the Sheeprock Mountains that went away as night came on. A few bones on the site from a deceased animal. Only a couple and I moved them out and away from where I observe. 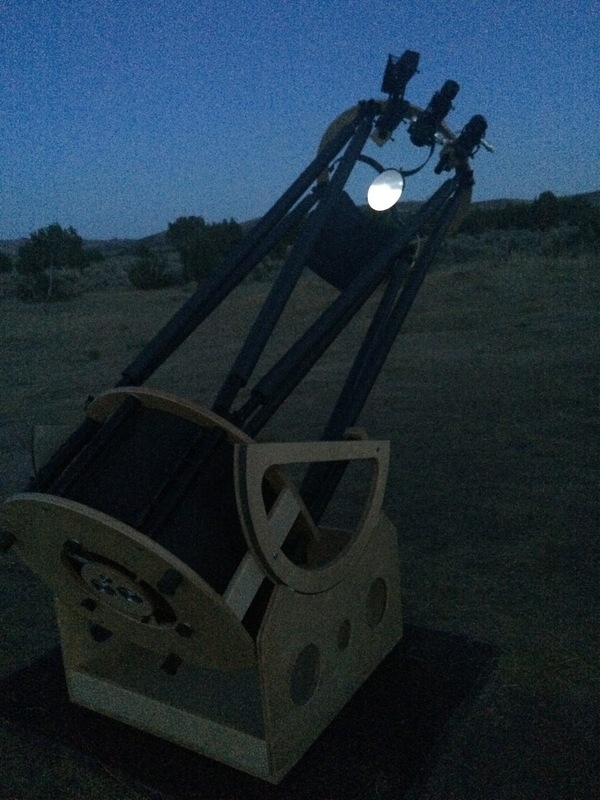 The 17.5" Dob "Star Catcher" ready to go. The clouds are gone. Observations occurred on December 19th through December 21st, 2017. Location is Forest Road 006 Juniper Grove. Time is from 17:30 to 04:00 on those days. Conditions were Antoniadi II, with temperatures ranging from a low of 3 degrees F to an more warmer average of between 16 degrees F to 19 degrees F. Instrument was my 17.5" dob, Star Catcher. I am making the sketches larger, they will go off the right side of the posting area so you can view them easier. We'll see how I like this set up. Off to work! 1. NGC 266 Face on Spiral Galaxy in Pisces. 22mm T4 Nagler, 7mm & 5mm Pentax XW, Paracorr Type II. NGC 266 is a bright, moderately size face on spiral galaxy that has a bright inner core, with a brighter bar seen. I captured hints of the spiral structure coming off the eastern arm, with a hint of another arm coming off the western arm. I have probably over emphasized the arms in the sketch but they were faintly observed. 2. NGC 274 and NGC 275 or ARP 140, galaxies in Cetus. 22mm T4 Nagler, 7mm Pentax XW, Paracorr Type II. NGC 274 is the brighter of the two galaxies and it is the upper top one in the sketch. NGC 274 in contrast to NGC 275 is round, has a bright inner core and well defined edges. NGC 275 is more oval, more diffused and larger and elongated SE-NW. Bright core wit a blending of brightness, maybe a hint of an arm unconfirmed. 3. NGC 392, NGC 394, NGC 397 Galaxies in Pisces, 22mm T4 Nagler, 7mm Pentax XW, Paracorr Type II. NGC 394 is the top small, faint galaxy; NGC 392 is the large central galaxy, NGC 397 is the faint galaxy down and to the left of NGC 397. NGC 392 is the brightest of these three galaxies though that isn't saying much. It is elongated SW-NE, with edges that are diffused and is grainy in its texture. NGC 394 is very faint, and a condense round patch of light. NGC 397 is roundish, decently bright and well defined. 4. NGC 410 & NGC 407 galaxies in Pisces. 22mm T4 Nagler, 7mm & 5mm Pentax XW with Type II Paracorr. NGC 410 is a relatively medium size galaxy that is rather bright. NGC 407 is next to 3 stars and is a smudge. NGC 507 shows an outer envelope and an inner envelope and is brighter toward the center though the center's brightness is smaller in size. This is the largest galaxy in the field. NGC 508 is a faint, round galaxy with an inner core appearing as a condense area of light at the center. IC 1687 is very faint, averted vision required to view it. NGC 504 is elongated SW-NE no structure evident and is a patch of light. 6. NGC 660 Galaxy in Pisces; 22mm T4 Nagler with 5mm & 7mm Pentax XW, Paracorr Type II. NGC 660 is a large and beautiful galaxy being oriented SW-NE. It has a very bright bar elongated SW-NE. The NE portion of the bar is very bright with a high surface brightness. The galaxy brightness diminished and becomes fainter and wider in the SW part of the bar and is fanning out from there. Central region is very mottled and dusty. The X looked more like a Y to me on the bar. Second faint arm on the NE and bends in the west giving the galaxy a warped S shape. Elongated almost perfectly laying east to west with tapered edges, and a diffused, opaque outer envelope. There is some brightening near the core. NGC 864 is a really interesting galaxy visually, especially at high magnification. A magnitude 10 star is imposed/embedded on the galaxy ESE of the core, almost overcoming the galaxy's bright core. The envelope is is diffused, round to oval in shape, more oval to me, elongated NE-SW to E-W. The inner core has a bar and the core appears round. Averted vision brings hints of structure in terms of arms. 9. NGC 908 a galaxy in Cetus. 22mm T4 Nagler, 5mm & 7mm Pentax XW, Paracorr Type II. NGC 908 has a very grainy outer envelope at high magnification, 600x-800x. It is very large, very bright with well defined edges, and is elongated ENE-WSW. Spiral arms are easily viewed and in evidence. 10 NGC 1044 & NGC 1046 Galaxies in Cetus. 22mm T4 Nager, 7mm Pentax XW, Paracorr Type II. NGC 1044 is the top and larger galaxy in the sketch. It is more roundish in shape to me than oval. Really, it is just a patch of fuzz in the eyepiece. NGC 1046 is smaller, fainter and more round. Another faint fuzzy patch of light. 11. NGC 1070 Elliptical Galaxy in Cetus. 22mm T4 Nagler, 7mm Pentax XW, Paracorr Type II. NGC 1070 is a larger galaxy with a diffused outer envelope and a brighter interior. Poor star field around it. NGC 1084 is well defined at the edges, opaque with brighter mottling over much of the disc of the galaxy. It is both bright and large. Structure is evident, arms are defined at high magnification and with averted vision. Great view! 13. NGC 1153 Galaxy in Cetus; 22mm T4 Nagler, 7mm Pentax XW, Paracorr Type II. NGC 1153 has a diffused outer envelope with a sharp, round core that is almost, not quite, but almost stellar. Round to oval in shape, more oval to me (seem more are more oval to me on this observing trip). 14. NGC 1232 Spiral Face On Galaxy in Eridanus; 22mm T4 Nagler, 5mm & 7mm Pentax XW, 4mm University Orth; Paracorr Type II. NGC 1232 is moderately large face on spiral galaxy (a grand spiral) and moderately bright. The galaxy brightens to a central core region visually and that core is well in evidence. Bar possibly observed here and hinted at in the sketch. Spiral structure is easily seen and sketched here. Wonderful at high magnification in a large dob. 15. NGC 1395 Elliptical Galaaxy in Eridanus. 22mm T$ Nagler, 5mm & 7mm Pentax XW, Paracorr Type II. NGC 1395 is an elliptical galaxy with an outer envelope that is faint, and a bright and somewhat large inner core region. NGC 1407 is the largest galaxy in this view, it is round, opaque patch of light with a large round, non-stellar core. NGC 1402 is WNW of NGC 1407 and is viewed as a faint fuzzy, almost stellar, patch of light. NGC 1400 is smaller than NGC 1407, down and to the right in the sketch, and is viewed as being brighter than NGC 1407 which is due to its smaller and more compact concentration. The galaxy is opaque with a bright even surface brightness in its outer envelope. 17. NGC 1600 Elliptical Galaxy in Eridanus; NGC 1601 & NGC 1603 galaxies in Eridanus. 22mm T4 Nagler, 12mm Televue Delos, 7mm Pentax XW, Paracorr Type II. NGC 11600 is a bright galaxy and is elliptical with a bright inner core region. NGC 1603 & 1602 are smudges of brighter light, easy to see in the field. 18. NGC 1624 or Collinder 53, Open Cluster in an Emission Nebula in Perseus. 22mm T4 Nagler, 10mm & 7mm Pentax XW, 12mm Televue Delos; Paracorr Type II. Bright and large emission nebula surrounding five main stars with smaller ones evident in the open cluster. NGC 1624.2 is the largest star in the open cluster and is responsible and the source for the ionization that is lighting up the emission nebula. NGC 1624.2 is the most magnetic massive star known, 35 solar masses and 20,000 times our Sun's magnetic field. The open cluster is very young estimated at less than 4 million years old. The emission nebula is easily seen and detail is evident. Looking carefully you can see how the emission nebula fades into the intergalactic background. This is one where the sketch in person is far better than the image captures as you can see more detail and faint detail in it. This is a very large and very bright spiral galaxy. The 22mm T4 Nagler easily detected the galaxy in its field of view. The edges and extremities fade into the sky background nicely. It is elongated NNE-SSW, the high magnification used shows a mottled core with bright extensions, Arms are evident. 20. NGC 1700 Large Elliptical Galaxy & NGC 1699 Spiral Galaxy in Eridanus; 22mm T4 Nagler, 10mm & 7mm Pentax XW; Paracorr Type II. NGC 1699 is on the upper top middle of the sketch and is a concentrated focus of light, a faint fuzzy with no structure except a well defined edge. NGC 1700 lays NNE to SSW while the core lays E-W. It is a young Elliptical Galaxy, possible from a merger from a smaller elliptical galaxy and a spiral galaxy and images from Chandra show a rotating disc of hot gases. The outer elliptical is bright, the inner core brighter and almost stellar in lower magnifications. 21. NGC 1961 or ARP 184 Spiral Galaxy in Camelopardalis. 22mm T4 Nagler, 7mm Pentax XW, Type II Paracorr. NGC 1961 is a distrubed spiral that is large, oval in shape and lays East to West. It has a very bright oval core that is offset to the northern part of the galaxy. Large arm is visible sweeping East to West, on the south side of the galaxy. Broad dust lane runs parallel on the inside of this arm. Small arms possible north to west, running west to south. Nice view. Again, here the original sketch is better than the photograph image above as the actual sketch has more subtle features and brighter and fainter parts stick out more. Still learning the camera I am using but the image is better that what I use to post. 22. NGC 1609, NGC 1611, NGC 1612, NGC 1613 Galaxies in Eridanus; 22mm T4 Nagler, 14mm Pentax XW, 10mm Pentax XW, 12mm TeleVue Delos, Paracorr Type II. NGC 1609 is a very small and faint galaxy that has a small condense and bright core, good stellar nucleus can be seen. NGC 1611 is a small, faint elongated WNW-ESE with a large bright core. NGC 1612 is a very faint, small, round shape galaxy that has a faint stellar nucleus and is the faintest galaxy in the group and in the sketch. NGC 1613 is small, faint, partially elongated SE-NW. Bright core with a stellar nucleus. 21. NGC 496, NGC 195, NGC 499, NGC 498 Galaxies in Pisces; 22mm T4 Nagler, 10mm & 7mm Pentax XW; Paracorr Type II. NGC 498 is a very small, extremely faint fuzzy galaxy with no details. NGC 496 is a faint, oval shape patch of light, elongated NE-SW.
NGC 495 is the western part of this triangle of galaxies and has a bright inner core region though it is a small galaxy. NGC 499 is the largest of the 3 galaxies, is a barred spiral but we cannot see the bar or arms visually, we cannot see any structure, and it is elongated just off the W-E line. Oval in shape. The nova was clearly detected on 2017-12-31.77 UT using 26 x 30s images obtained with a 0.35-m Meade Schmidt-Cassegrain Telescope, working at f/6.3 with a clear filter and a Starlight Xpress SXVR-H9 CCD camera, at the West Challow Observatory UK. The discovery magnitude is 18.41±0.04 mag in the CV band (clear visual). The discovery was confirmed at the Ondrejov observatory. We will continue to monitor the nova light curve and strongly encourage additional follow-up observations. The Liverpool Telescope (LT; Steele et al. 2004) obtained a 600s SPRAT (Piascik et al. 2014) spectrum of this eruption at Dec 31.88 UT. This spectrum shows clear detection of Hα, Hβ, Hγ, and Hδ emission lines on top of the detected continuum. The spectrum is similar to the early time spectra obtained after the 2015 (Darnley et at. 2016) and 2016 eruptions (Henze et al. submitted). This spectrum confirms that this transient event is the 2017 eruption of M31N 2008-12a. A January 1st, 2018, ATel reports this LINK3 . On January 2nd, 2018 in this ATel observation LINK4 by the Swift Telescope were reported on this Recurrent Nova. Kinda of cool what it shares here. Within the framework of a comprehensive monitoring campaign we obtained the first UVOT data of the 2017 eruption on 2018-01-01.22 UT; only 11 hours after the discovery on 2017-12-31.77 UT (ATel #11116). The nova was clearly detected with a uvw2 filter (Vega) magnitude of 17.2±0.1 mag (uvw2 central wavelength 193 nm) in a 1-ks observation. The magnitude estimate is preliminary, assumes the UVOT photometric system (Poole et al. 2008), and has not been corrected for extinction. Nothing is detected in the corresponding Swift XRT exposure. We will continue to monitor the UV and X-ray evolution of this exceptional nova. This ATel from January 3rd, 2018 shows more multicolor optical photometry of the 2017 eruption. LINK5 This shows the rapid falling of the Nova as was observed in previous eruptions. We report additional multicolor optical photometry of the 2017 eruption (ATels #11116, #11117, #11118, #11121) of the remarkable recurrent nova M31N 2008-12a (Henze et al. 2014, 2015a, 2015b; Darnley et al. 2014, 2015, 2016) acquired with the 0.65-m telescope at the Ondrejov observatory under variable conditions. For the measurements, we used co-added images obtained from many single 90-s exposures to suppress the effect of high background caused by strong moonlight. The results presented below are consistent with the expected rapid fading of the nova observed during previous eruptions (e.g. ATels #9848, #9861 or ATels #7964, #7976). This ATel from January 4th, 2018 shows more optical photometric observations of the 2017 eruption. You can find it at this LINK6. In ATel #11116 we announced the discovery of the predicted 2017 eruption of the recurrent nova M31N 2008-12a on 2017-12-31.77 UT. We reported the follow-up UV detection with Swift/UVOT in ATel #11121. This is the 10th observed eruption in 10 consecutive years of this unique nova system (cf. ATels #5607, #6527, #7964, #9848). Comprehensive multi-wavelength studies of previous eruptions were published by Darnley et al. (2014, 2015, 2016) and Henze et al. (2014, 2015a, 2015b, 2018 subm.). For additional optical photometry and spectroscopy of the ongoing eruption see ATels #11116, #11117, #11118, #11124, #11125, #11126. Here we report the start of the supersoft X-ray source (SSS) phase of M31N 2008-12a. A faint X-ray counterpart was detected in a 5.2-ks Swift observation starting on 2018-01-05.48 UT. We measured the preliminary XRT count rate to be (3.1±1.0) × 10-3 ct/s (corrected for vignetting, dead time and PSF). No X-ray source was detected in the preceding 1.2-ks Swift observation on 2018-01-04.48 UT with an 3σ upper limit of 6.0 × 10-3 ct/s. If we assume an eruption date of 2017-12-31.77 UT (MJD 58118.77), identical to the discovery date (ATel #11116), then the SSS counterpart appeared around day 4.7 after eruption. This preliminary estimate is somewhat earlier than the 5.9±0.5 days measured in 2014 (ATel #6558, Henze et al. 2015), the 5.7±0.5 days seen in 2015 (ATel #7984, Darnley & Henze et al. 2016), and the 5.8 days observed for the peculiar 2016 eruption (ATel #9872). This might suggest an earlier eruption date, which we are currently working on constraining more accurately. In addition, the nova is still detected as an UV source but its magnitude has declined significantly to uvw2 = 19.3±0.1 mag (cf. ATel #11121). Our preliminary magnitudes use the UVOT photometric system (Poole et al. 2008, Breeveld et al. 2011) and have not been corrected for extinction. The next ATel on January 6th, 2018 reports additional multicolor photometry of the 2017 outburst of Recurrent Nova M31N-2008-12a. It gives a clear view of the rapid brightening and then rapid fading of this remarkable recurrent nova. We report additional multicolor photometry of the 2017 outburst of the remarkable recurrent nova M31N 2008-12a (ATels #11116, #11117, #11118, #11121, #11124, #11125, #11126, #11130, see Darnley et al. 2014, 2015, 2016 and Henze et al. 2014, 2015a, 2015b for comprehensive multi-wavelength light curves of previous eruptions). The magnitudes and upper limits for the nova are given in the table below. Filter ``L'' magnitudes are obtained from the observations with a luminescent (IR cut) filter. The last ATel I have seen regarding the eruption of the remarkable recurrent nova M31N-2008-12a. It shows how the fading of the Nova quickly after outburst on 31st of December 2017. You can find it at this LINK8. So the remarkable Recurrent Nova M31N 2008-12a went into eruption again for the tenth year and shows this recurrent nova is indeed growing closer to the Chandrasekhar limit of 1.4 solar masses and will then either erupt into a Type Ia Supernova or collapse directly into a neutron star depending on wither it is a Carbon Oxygen White Dwarf (Type Ia Supernova when it reaches the Chandrasekhar limit from accretion from the binary star) or a Neon Oxygen White Dwarf (collapses into a Neutron Star when it reaches the Chandrasekhar limit from accretion). Rather cool to see that this has happen for the last 10 years and probably has actually be occurring for million of years. Remember this may be repeated in March when our Sun interferes with imaging M31 from earth. This link to my Observing Sites will show you where I mainly observe. You'll find me during the two weeks of the wanning stage and new moon in one of these sites. I'll list one of my favorite sketches from time to time. A new moon evening . . . Copyright Jay L Eads 2008-2017. Items or posts only to be used with permission. Picture Window theme. Powered by Blogger.